Why golfers are turning their backs on titanium to take up the game from what they say is a purer era. What was it Sir Winston Churchill said about golf? “It is a game whose aim is to hit a very small ball into an even smaller hole, with weapons singularly ill-designed for the purpose.” Well, Sir Winston, that’s not really as true as it was in your times. Indeed, it’s not even as true as it was 20 years ago. Advancements in technology have seen to that. Modern weapons (made from titanium, forged composite and tungsten weights) are now considerably more effective and all-purpose than they used to be. So, why – in the name of Willie Auchterlonie – would anyone want to revert back to a bygone age, and play with old hickory clubs? Why would anyone want to attempt to play with implements which have sweetspots the size of a pin-head, when a new, modern driver (made from 7 million turbostratic carbon fibres) can offer you one the size of a frying pan? And why would you carry only six clubs, which rattle around like broomsticks in a skinny, leather, pencil bag, when you could have 14 on a De Lux Lithium, state-of-the-art, remote-controlled trolley? Boris has a far-away look in his eyes and a serene grin on his face, like someone who has found a new religion. And when you get talking to enough hickory-converts, you learn that this “Eureka” moment is very typical. Many hickory players talk of a Road to Damascus epiphany, when they suddenly and unexpectedly see the light. Lietzow and Werner are part of an ever expanding army of hickory devotees, from every corner of the globe. It is no exaggeration to say that hickory golf has seen exponential growth in recent years. Many are rushing to the attic, to pull out their grandmother’s dusty, old hickories, just to see what they feel like to swing. Did you know, for instance, that this year it will be possible to play in a hickory event, somewhere in the world, every week except Christmas week? And there is even talk of an event then; astonishing, but true. In Sweden this year, there will be 30 events. 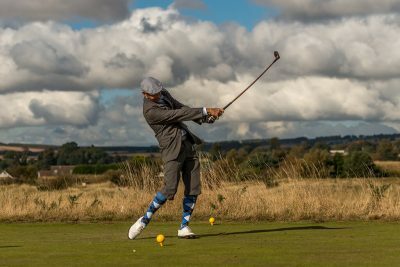 The Open Championship of hickory is the World Hickory Open, which was held last year at Craigielaw Golf Club, 10 miles east of Edinburgh. 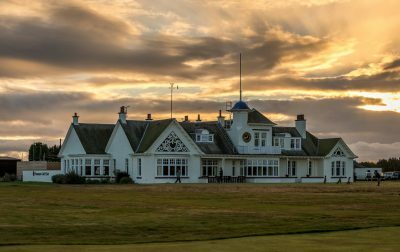 This year, it is going to the Burnside course at Carnoustie, and Monifieth Golf Club on October 8 and 9; and – for a very modest entry fee – you can play in it. But, there are also hickory events in every state in America (except two) and you will find hickory advocates from Australia to Zimbabwe. Period dress is encouraged, but not compulsory. 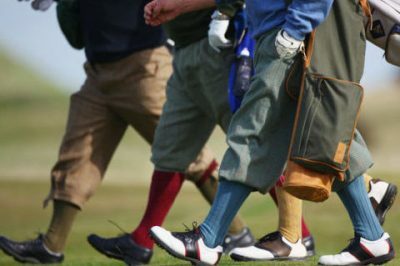 For the World Hickory Open, men in tweed plusfours, and women in long skirts and bonnets, fly in from all over the world. There is a 36-hole competition; but the après golf, which is both hearty and lengthy, is the raison d’etre. And, that’s another reason to take up hickory golf; the taking part is just as important as the final result. “People play hickory because of the overall experience,” explains Werner. 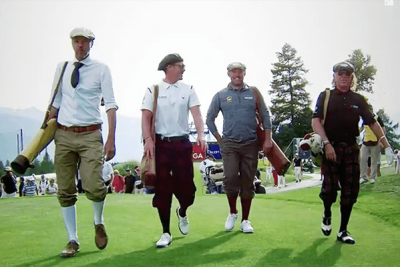 “To start with, you need to be interested in the history of the game; and then it gives you a great appreciation for just how good these guys from the past were. It teaches you to manufacture shots, because with a hickory shaft, you can’t just bash at the ball. Hickories twist more than steel shafts as a rule, which is why you need to swing slower. If you ask a pro, he will tell you that hickory golf is actually very good for your golf swing, because you have to swing it slower, and you have to have a lighter grip. The other great benefit of hickory golf is the time it takes, with three-hour rounds the norm. Modern golf is so slow, it is putting people off. 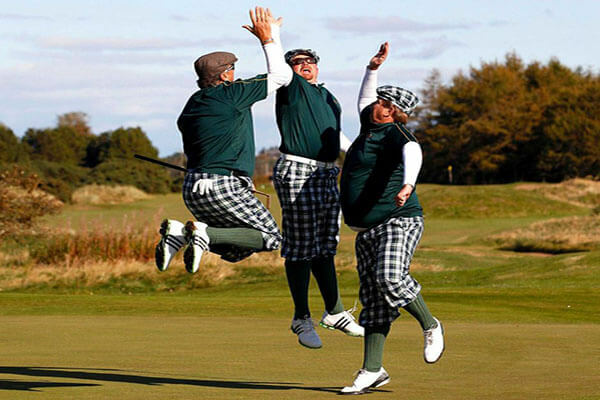 At the Solheim Cup last year, fourball matches were taking up to six hours! And club golfers mimic the pros. “When people see you with hickories,” says Werner, “they know you play fast. Letting people through, if they’re playing fast, used to happen everywhere; but in the last 20 years people seemed to have stopped it. We try to keep traditions like that alive.” Though the World Hickory Open is a 36-hole strokeplay event, most hickory events are matchplay (often foursomes) just like they used to be in the early days. Hickory golf has a resonance of being from a different, more romantic age. Great golfers in the late 19th and early 20th centuries were artists. Their clubs were works of art, and had names rather than numbers. They were called things like ‘mashie’ and ‘niblick’, ‘brassie’ and ‘spoon’, spade’ and ‘jigger’. 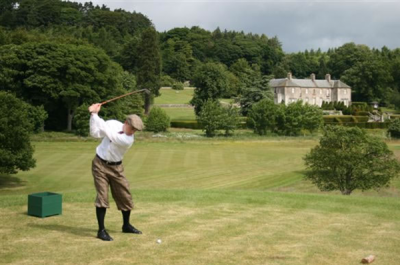 The hickory game is as different from the modern game as seven-a-side rugby is from the 15-a-side version, or Real tennis is from the Lawn variety. “The other great thing is it tests your patience,” says Mike Redferne, who plays off 15 at North Downs. “I play with only six clubs, and that means you just have to manufacture shots. There is no choice. Say I’ve got a shot of 120 yards; well, I’ve got one club which hits it 100 yards, and another which hits it 150. So, what am I going to do? Modern clubs are devised to make it easier for everyone to play. And so, by definition, hickory golf is harder. A lot more skill is required. You have to be so much more creative. I think it’s terrific also that a bit of period costume comes out. It all adds to the theatre and the experience.” Most hickory players today carry no more than six clubs. It makes the game a lot faster, and there is literally and metaphorically less weight on your shoulders. Club making came into its own with the advent of the feathery ball in the late 17th century. Suddenly, clubs didn’t have to withstand the impact of striking a solid, wooden ball. As a result, artistry was given a free reign. Elegant wooden clubs were made from a large number of different materials like apple and pearwood, ash, thorn, greenheart, purpleheart, lancewood, lemon and orangewood and blue-mahoo. But eventually, by the middle of the 19th century, hickory (which still all comes from the United States) was thought to be the best for shafts, because of its strength and flexibility. The story of Scotland’s master clubhead makers – the Dicksons, Hugh Philp, Robert Forgan and others – at the end of the 19th century, is a wonderful tale. It wasn’t until 1924, when the USGA legalised steel shafts, that the age of hickory showed signs of ending. At the time, the R&A ruled “it is much to be deplored that players, instead of trying to master the use of clubs, should endeavour to overcome the difficulties of the game by using implements which have never been associated with it”. And yet, six years later, they had legalised steel shafts as well, and effectively signed a death warrant for hickory. Part of the credit for the recent, massive growth in hickory golf must go to a man called Lionel Freedman; a former stockbroker, who is now a philanthropist, hickory devotee, and benefactor of the World Hickory Open. I dread to think how much of his own money Freedman has ploughed into the WHO, since its inception in 2005, but, given there was a lot of prize money in the early years, it is a significant amount. Freedman also produces a very professional monthly on-line magazine called World Hickory Golfer (www. worldhickorygolfer.com) which is the bible. “For me,” he says, “much of the beauty of playing hickory comes from the appreciation you get of how great these past masters were. Last year, I was behind replicating The Great Match between Old Tom Morris and Willie Park Senior in 1870. The original match was played over 144 holes; over four courses in four days. We played 72 over the same four courses; St Andrews, Prestwick, North Berwick and Musselburgh. The best hickory player in the world is probably an Australian who lives in Germany called Perry Somers; who has won as many as seven hickory titles in the same year. He cut his golfing teeth on variety of small tours, and has played in the Australian Senior Open; but his first love is hickory. In the re-run of The Great Match, Somers played a native of Omaha, Nebraska called Randy Jensen, a seven-time winner of the US National Hickory Championships. Like most hickory nuts, Somers and Jensen are part-time golf historians. They know a Tom Stewart (St Andrews) club from a George Nicoll (Leven), a Robert Forgan (St Andrews) from a William Gibson (Kinghorn). When you swing a modern 7-iron, it is likely to swing in a very similar way to the 8-iron in the same set; this isn’t true of hickories, which tend to have very different swing weights, flex, torque and balance points from club to club. “Getting the perfect hickory set is a project of a lifetime,” says part-time clubmaker, Ingvar Ritzen. “I built the perfect set of modern clubs a long time ago, but you just can’t say that with hickories. Like the perfect round of golf, you are always trying to get there, but you never do. Hickory has life; Steel doesn’t! The hickory revival goes from strength to strength. There is now a Hickory Grail, a hickory version of the Ryder Cup, which was played at Falsterbo in Sweden in 2009, and at Pinehurst in North Carolina in 2011. This magazine got US Open Champion Geoff Ogilvy to play with hickories around Prestwick a couple of years ago. There is even talk of a professional Hickory Tour. How much more interesting would it be to watch professionals playing with old clubs around old courses, rather than the endless diet of 72-hole tournaments we currently experience? You don’t have to be around hickory lovers for long to realise their raw enthusiasm for the hickory game is contagious. “In many ways,” says Lietzow, “the guys who played years ago are much more impressive than the modern players. At Wannsee Golf Club, Harry Vardon shot a course record 67 in 1928, with hickory clubs and a gutty ball. That record stood for the next 50 years, and the course didn’t change one bit. And then finally, Nicklaus came along in 1978, using MacGregor clubs, and shot a 65.